Concerto Caledonia is Scotland's baroque ensemble, specialising in the music of 18th century Scotland played on period instruments. 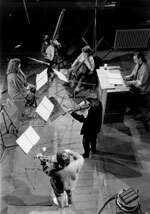 With recordings of the music of John Clerk of Peni­cuik (Hyperion, 1998: 'definitely one of the most important releases of Scottish music' The Scotsman) and James Oswald (Linn CKD 101: 'I hummed 'The Thistle' for a week' Gramophone), the group has brought a vital part of Scotland's musical heritage to a wide audience, and has appeared at festivals of classical, early, contemporary and world music throughout the UK and in Europe. In summer 2001 they gave sold-out performances of their performing version of Allan Ramsay's pastoral ballad opera The Gentle Shepherd at the Edinburgh International Festival, and released a CD of Scottish-Italian music called Mungrel Stuff (Linn CKD 140), a Sunday Times Record of the Year ('bizarre, but utterly compelling'). Following on from their recording with Cape Breton fiddler and baroque violinist David Greenberg Spring Any Day Now, which features music by Frank Zappa and Fred Frith alongside old and new Scottish music, the group has formed an offshoot touring quartet 'Lion' to explore the synthesis of early, traditional and contemporary music. The group will be a resident ensemble at Perth's new Concert Hall from late 2005.